Sigh. Just when you think it's over, it happened again. Two more fresh piles of poop in the smell/sight line. And there was a small piece of cellophane stuck to one of the piles. Not clear on whether it just blew there from the trash people throw on the street, or whether the neighbor left it there to be sure I'd notice the crap. Well, either way, I decided to give the subtle approach one more try before I escalate to a more direct confrontation. I moved the piles again, only this time I left them a little closer to the motorcycle. As in directly in front of it. And I sprayed the bejeebers out of the grass where the dog craps with Lysol cleaner too. Hoping this time the message will get through. And no, that's not a picture of the dog in question. 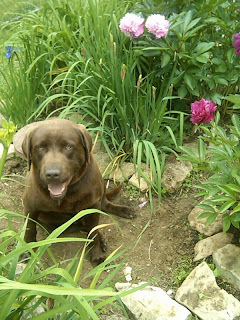 He does look a little like that but he's a lighter, creamier brown. This pup I stole from Uncle Blodge, who has a lot of interesting photos of Philly and great taste in youtube music videos. Week two. They seem to getting over the transplant shock. Hoping they start really growing by next week. Other stray thoughts. It takes exactly 33 minutes to go a leisurely stroll to the convenience store for the Sunday paper and back. I could do it in 20 or even a little less, but you would have to be crazy to powerwalk in this heat. Even at 10:00am, the sun was already hot. But the early mornings are very cool here. A couple of days ago it was 99 degrees in the sun at 7:00pm. The next moring it was 68 at 7:00am. Haven't turned on the AC yet because it's only hot in the house for a couple of hours in late afternoon to the early evening. Once the sun goes down, it chills down quick. I suppose I won't like that so much in the winter but it's great for now. Update on the dogsh*t problem. Isn't a problem anymore, at least not so far. He was definitely bringing the dog to the tree in the front of the house for at least a couple of days. I could smell it when I walked by on my way out to the store. And the dog is a sweetie really. He seems to have gotten the message that under the tree is the place to go. I saw him taking a dump under the beech tree yesterday. That's okay with me. Can't see it or smell it from my side of the porch. Meanwhile, the baby wrens that live in the nest they built in the neighbor's awning have started to fly. They're very cute and being babies, aren't at all afraid of me. They sit on the step on look at me once in while and don't fly off if I talk to them. It's fun to watch them learn how to get around. They're smart too. One of them was trying to get to the roof and figured out he could hop up the ladder that sits outside my neighbor's door. He hopped up one step at a time. I'd love to get a photo, but of course, if I take the camera out, they don't come around. They only do the cute stuff when I don't have it with me. I went to the Mexican grocery store yesterday and remembered my camera this time. I only took a couple of shots because the displays hadn't changed much except they were looking a little tired. And I really had to pee so I wasn't up for a long tour through the store. 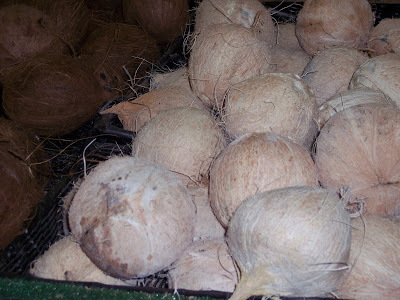 But here's the white coconuts. They weren't quite as white these week. Last week they were all really white like the one in the foreground and hairier. And I was surprised to find out when I picked up a couple to arrange them better that they're soft. They're somewhat unpleasant as they age. I raised a small cloud of fruit flies when I moved them. Which may explain the spots... Don't think I'll be buying any of those. Meanwhile, these things held up much better but I've already forgotten the name of them. 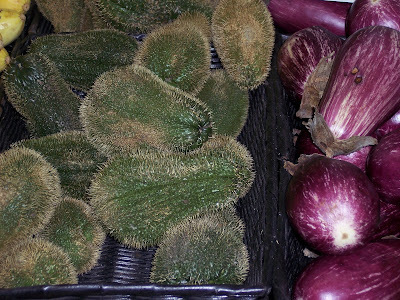 They're the spiny version of another fruit that looks kind of like a pale green shrunken pepper. I didn't touch these. Those spines look like they might stick in your fingers. I don't know where where my neighbor's dog was pooping before this, but I suspect it was under the tree since I had never seen any crap on the lawn until two days ago. After the tree was pruned, for two days running my neighbor let his dog take a dump about 8 feet in front of my side of the porch. Directly in the sight/smell line. He didn't pick it up. Needless to say, this pissed me off. I wasn't sure what to do. I'm an easygoing person and I'm not one for confrontations. But neither am I willing to deal with dog sh*t. If I'm going to have to pick it up, I want my own dog to go with it. I wasn't about to knock on his door and holler, but he was clearly avoiding running into me on the back porch. I mulled it over and finally waited until he went out. Then I moved the crap over to his side of the yard. I piled it up neatly near his motorcycle. But I was nice about it. I didn't leave it in a place where he would step in it or anything. I suspect it pissed him off anyway. I heard some gratuitous slamming of doors, but what's he going he say? Why did you put my dog's poop on my side of the yard? Anyway, I think he got the message. Now 24 hours without a fresh pile and I'm pretty sure he walked the dog on the other side of the house or something last night because the porch light was on and I heard the dog bark, but he wasn't on his chain, as he has been every other time. So in a way I did the dog a favor too. I've never seen him actually walk that poor pup since I've been here. The lawn guy is really sweet. He brought my trash can back from the street last time he was here. He's friendly and he's very good looking. He only shows up twice a month. The grass gets pretty long in between, but once he gets here, he does a really good job. He was here for three hours last time and it's not that big a yard. But's he very meticulous. He even sweeps the grass clippings off the porch. However, I'm not that happy with his thoroughness this time. 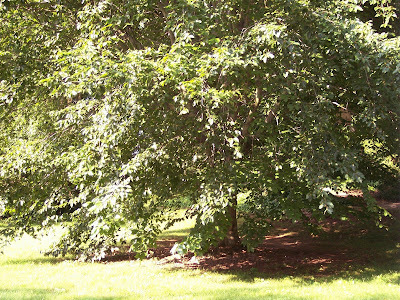 You'll recall how much I love my beech tree. Last week it looked like this. Not sure why he was so inspired, but this time he decided to do some pruning. Now it looks like this. It's like giving Samson a haircut. 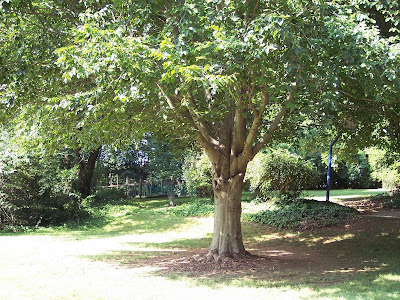 The tree's spirit feels diminished somehow. And it's changed the whole view. Now I can see the neighbor's yard. Not that anyone is ever out there, but it feels less private back here now. But what's done is done. I guess we'll both get used to it. 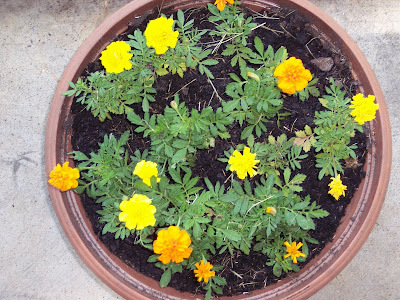 My marigolds. They got a little beat up during the transplant but they've perked up since. This will likely be the sum total of my garden so I'll try to take a picture every week to track progress. Took my first walk last evening. I brought the camera but had to dump all the shots. It was a little too late and the light wasn't strong enough for my cheap camera. As it turns out distances are a lot shorter on foot than they look on the map. It's only a ten minute walk to the convenience store and Walgreens. And I took a peek into the Food Lion that's next door. It looks a little smaller so assuming they carry the few items I buy regularly, I think I'll make that one my primary store. I hate grocery shopping so the smaller the store, the better for me. I also discovered that the big park near me is actually a giant cemetary with the tennis courts tucked into the far corner. The courts are nice. Lots of them and they stay open until 11:00pm. Of course I don't have a tennis partner but I do have a racquet and they have a good practice wall. Meanwhile, the cemetary is very cool. Not a lot of old headstones but it's honeycombed with winding roads and really interesting trees. Plus they allow decorations and some of the plots are, shall we say, very colorful. Reminds me a bit of a cemetary I saw in Belize. Can't wait to explore it more. I'll definitely be posting some pix from that place. Just a quick update on progress at the new home. I finally finished the heavy cleaning. All 12 windowpanes of all 10 windows have been bleached, as have all the baseboards and doors inside the house. Every wall has been scrubbed. Every floor has been washed. All I have left is the inside of the four closets. The musty smell seems to be gone, at least it is during this hot spell. I had the place closed up for hours yesterday while I did some shopping and my laundry and when I came home the place felt like a oven, but it didn't smell. The test will come the next time we have a rainy spell. But I feel like I can take it a little easier and start enjoying the town while I unpack at a more leisurely pace. I'm still discovering new places to shop and new routes to get around. Finding great cross streets to get to the stores with no traffic lights and few stop signs. Made it to the Walgreens drugstore that's within walking distance yesterday. I have to admit I drove there because I was already out, but it's a great drugstore. Well stocked and I got some great deals. I also realized it's right next door to a smaller Food Lion and more importantly the little cafe I discovered here years ago that makes great bagels. Also went to the Mexican grocery store. That was very cool. Great produce department. It sells roots I've never heard of and the familiar produce is really cheap and looks better than at the mainstream grocers. I saw a white coconut for the first time in my life. Didn't even know there was such a thing. It was so beautiful I wanted to buy one just to put on the mantle since I don't really like to eat fresh coconut. Didn't do it but I'm bringing my camera next time I go to that store. I also scored a bottle of Guatemalan beer that I never tried before. Won't try it again. Famosa. It's like a headache in a bottle. Glad I only bought one. I have a bunny in my backyard. I've seen him several times, but everytime I go to get the camera, he disappears before I can get back out. I'll get a shot of him one of these days. He's very cute. The trip to the laundry was a horror show. I was very excited to discover there was one in the shopping center just up the street. I hadn't noticed it before because it looked abandoned. Once I got inside I realized why. That deserves it's own post though. I'm going to go back and get some photos before I tell that story. Meanwhile, I'm off to spend the afternoon with my Dad for Father's Day. The first time I've been able to do that for far too many years. Hope you're able to spend it with your Dad too, or if you're a Dad that your kids are treating you well on your day. Have a happy one. I always loved day lilies, even these common ones, although they come in many more exciting varieties. These are edible. I used to make tempura with the flowers but Hecate has a great recipe for crab stuffed blossoms. And a few other links to clean up my hold file. Phila finds a great gallery of abandoned motels that once thrived when family vacations were taken on the scenic two lane routes. I remember staying in many places just like these. John Cole's pup Lilly is loosening up as she gets used to her new digs. And it's been much too long since I linked to m. heart who always has a blogful of wonderful pictures of the Happy Valley. I especially liked this series of shots of Smith Gardens at sunset. I love this guy's animations. In my next lifetime, I want to be a computer geek that can do this stuff too. Sorry, I fell down again on posting. The cleaning has been wearing me out and I lost a day for posting while the plumber was here. He took over the computer room to fix the shower. The worst part is, he did a lousy job. The fixtures are wiggly and he has to come back "some day" and fix it. So I can't put anything in the closet until he's done because that's where the access panel is. Still, I'm seeing the end of the cleaning thing. Soon I'll be able to enjoy this place. I'm unpacking things I haven't seen in five years. Mainly photos and sentimental trinkets. Odd really to do it now since I only expect to be in this place for six months but they need airing out and reorganizing anyway. Need to be repacked in new boxes. The old ones are quite musty at this point. Speaking of musty, the problem here seems to be dissipating with the massive cleaning. Of course I haven't left the house much so the doors have been open for days. Even though it's been damp as hell, the wind often kicks up and whistles through the house. I think it helps. It's much cooler here than it was back in the Triangle. I have no idea if my AC works because I haven't had to turn it on yet. It's cool enough in the morning to wear a sweater and I've been sleeping in my fleece pj bottoms. The humidity is worse in a way when it does get warmer, but not nearly as bad as New England in August and the air quality here is so much better, probably because we don't get the pollution from any big city. On the plus side, my hair is getting curlier every day. I spent most of my teen years wising for straight hair. But when I got it, I found I missed those curls. Anyway, the sun is out today. Hope it gets hot enough to dry out my house plants so I can bring them inside. I had to repot my palm tree the other night after it fell off the bench and shattered its pot. It needed to be done badly. It was all roots and no soil. I sliced the root ball mercilessly, and cleaned off all the dead leaves. It seems quite content. But I watered it down heavily and it's still leaking water from the bottom. Needs to be much dryer before I bring it in. 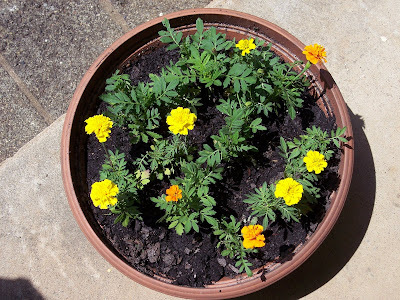 I also planted a pot of marigolds to keep on the porch. I haven't planted anything since the first year I arrived in NC. It remains to be seen if the baby bunny I saw in the backyard this morning will eat them. But it would be worth it if I can get a picture of him. Hope to get some better photos up soon. I have ten windows, two doors and two porches. It's a lot like the apartment in Noho, only bigger. I got my new recycle bin today. Recycling is really complicated here. They only take clear glass, aluminum cans, certain plastics and newspapers at the curb. To recycle colored glass, tin cans or mixed paper you have to go the bins at the police station. That probably explains why I didn't see any bins on the street last week. I'm betting most people just throw everything away. Making progress with the neighbor. Or at least with the dog. Neighbor doesn't say much but the dog gave me a good long sniff tonight and sniffed my door too. 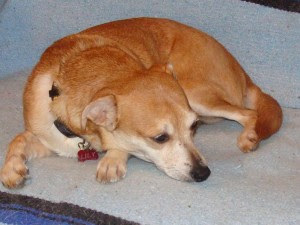 He even wagged his tail when I talked to him. I figure pretty soon he'll be snarling to protect me, instead of at me. Busy day. I'll try to post a moving story a little later but for now, here's Lily. John Cole got her to keep Tunch company. Apparently she was very shy at first, but she's warming up to her new home. Sounds like a real sweetie. For obvious reasons I'm trying to keep my expenses down so I decided that I wasn't going to pay for cable TV here, or as most everyone has, Direct TV. So I was discussing this with my Dad and he came up with a brilliant solution. Rabbit ears! 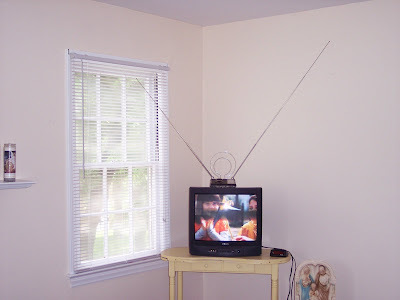 I had no idea you could still use rabbit ears but he had these old ones and they worked fine for the last week. I got two stations. More than enough if I wanted some mindless entertainment. Of course with the digital switch yesterday, they stopped working but fortunately, I already had a digital converter box for antenna use that was gifted to me. The old ears pictured here still didn't work, but I bought a new one for ten bucks at Odd Lots and I now have free digital teevee. I hated to give up the old ears because they were just so cool looking but the new one is about the same. More plastic and you have to plug it in but it still has the round face and looks like a crazy teletubby landed in my living room. I seem to get between one and five different stations, depending on the weather I guess. Unfortunately, three of them are Fox stations of some sort. And one of those is a static map of the area that drones on about the current weather conditions. And another of the stations is just a weather report but with a better map. Still, I get some NBC network reliably and possibly the Fox entertainment channel sometimes when the signal isn't breaking up. So maybe I'll still be able to see House once in a while. And gratefully, none of the stations are Fox News which surely would have drove me to suicide. Cheap and low tech. My kind of progress. In other news, I'm learning my way around town and discovering the secrets of my little hood. I figured out that I have a Walgreens and a funny little local convenience store run by the sterotypical Indian guy within reasonably easy walking distance through the nice part of the neighborhood. And I'm learning which stores are good for which purchases. There aren't really any little local garden centers around so you have to rely on the big box places for plants. I discovered yesterday that Home Depot is the best place for that. Also, one of the best features of this place is there are hot air balloons. They have an annual rally in the fall and at least one local commercial balloonist in residence. I was reminded of this yesterday when I saw a hot air balloon just hanging on the horizon in the late afternoon haze. There's a lot about this town that reminds me very much of lovely downtown Northampton. Life is beginning to feel good again. The plumber came yesterday and put in new faucets at the kitchen and bathroom sinks and the cleaning is almost done, so it's starting to feel like a functional home here. I've been promising you some photos and I finally installed the unit to upload them so here's a few to start with. The quality is not that great because it's not the best lighting conditions, but we've had so many afternoon storms that I thought I'd just grab a few shots while I had some sun. This first one was actually before I moved in. I took it from the hotel on the day I decided to take this place. 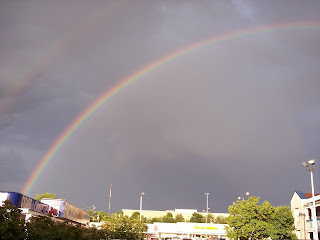 I wish I had a better camera and could have taken a wide angle of this rainbow. It was a perfect double arc from horizon to horizon. This next one is the view from my front door. I live on a very busy street but the house is set back and this tree provides enough screening so it feels private even when the door is wide open. 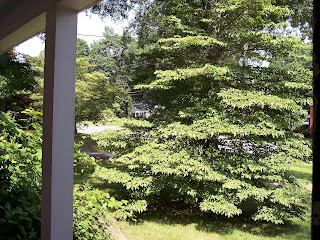 And this is a lousy shot of my giant beech tree. It's hard to get a good shot of this one because it's so thick and you can't really capture how very present it feels. It has a strong spirit. 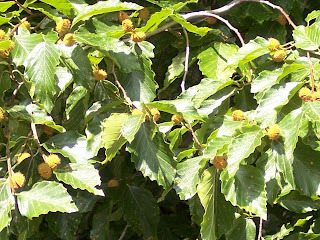 And here's a close up of the beech nuts. The tree is covered with them. Unhappily though, I see all this rain is not good for it. The leaves didn't have that blight on them last week. Still it seems healthy so I guess it will be all right. If you click on the photos to embiggen them, they look marginally better. 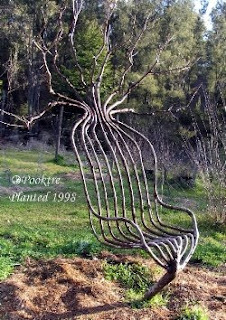 I may have posted about this guy before, but it was a long time ago and my Dad and I were just talking about another guy who does tree furniture, so I'm reposting it. I love this stuff. The guy has been doing it for years. Lots more at his website. I'm already feeling sort of at home in this town. It was a good move. I feel happier. After all those months in virtual isolation, it's good to be in a place where I have people who are glad to see me. The black depression I've been in for so long seems to be finally lifting. The town is interesting. I've had to do a lot of running around but nothing is more than three miles away and I've been learning the back streets to avoid the lights. The traffic lights here are ungodly long. On the bright side, you can be two blocks away and still get through a green light if you have one. Slowly cracking the new neighbor. I think he's probably cooler than I initially thought. The other day he was blasting some really great old blues music while he was doing his house work. And he let his dog sniff me for two seconds when he let him out to pee. Jake is a good dog. Just some kind of mutt but he's really well trained. He'll stop on a dime when Hal speaks to him. And he's pretty. He's the color of coffee with good cream. Meanwhile, I discovered I have lightning bugs and a resident dragonfly. Huge black guy that buzzes around the yard with great authority. Life feels good again. My installation kit finally arrived and I'm back on line. It feels great to be connected again. It was only a week but it felt like years. I'm still far from being moved in, but as I get the rooms cleaned up, I'm liking the space more and more. It's a quirky old apartment but it has its charms. And the back porch and back yard really are fabulous. It turns out the moon really does rise right in the middle of my open patch of sky and even though there's a lot of ambient light so I don't see much in the way of stars, I did see one really bright one in the same place after the moon went down. And the bird population keeps growing. I'm going to have to get out my Peterson's field guide, there are so many I don't recognize but it feels kind of like Noah's ark out there. I swear I have two of everything. I saw a pair of cardinals for the first time yesterday. And I have a flock of swallows. They're such show offs. Two of them practically buzzed me this morning. I'll have some pix in the next couple of days, I hope, as I have more time. Ina is doing 100 pieces of art in 100 days. This is one of my favorites but there's lots more at the link. I hadn't realized I was out of future posts. So here's starting again. 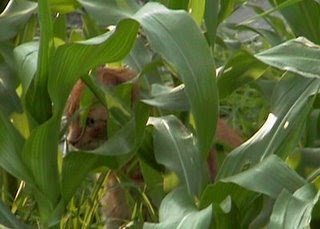 Tiger of the corn. And Monkeyfister has a helluva great garden besides. Well, the moving out is over so now I'm down to the dreaded moving in. It's a bigger chore in the low rent district. You get what you pay for and the place needs a major cleaning to be liveable. It's going to take a week to get it done right. The hell of it is I know I'm not going to stay there for more than the six months. It's a lot of work for a short time. I'm bone tired. Of course on the bright side, I'm getting a workout like I haven't had in a long time. I can feel my physical strength coming back. So there's that. The space is charming. Hardwood floors. Lots of windows. And an interesting room configuration. All the rooms radiate off a kind of square hall that's big enough for some small furniture. I love the setup but I've discovered after several days of rain, it has a dampness problem that I think won't be easily solved. The next door neighbor turned out to be a cranky "get off my lawn" kind of guy with a vicious dog. On the plus side, it is in a good neighborhood. It's centrally located. It's close to the best Chinese restaurant I've been to since I've moved to the south. The back porch is great. The yard is pretty. 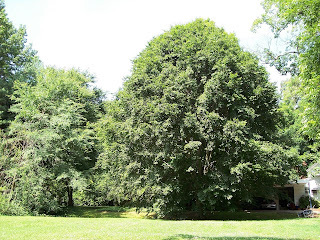 There's a gigantic beech tree in our yard and all the neighbors have mature plantings, so it's private. But there's still a big patch of open sky so I'll be able to see the moon. And there's so many birds and they're friendly. One of them is a bluebird. A little brown guy I haven't quite identified yet appears to have a nest in the tree under the window where my desk is going to be. He's already talking to me. And of course, the best part is being close to my Dad. I've really missed him. I'll be doing the big move for the next couple of days so it's not clear how much I'll be posting. Not much is my guess. Meanwhile, I was looking at the rental agreement for a place I didn't take for other reasons and I see that two of the rules of renting are you're not allowed to get drunk at home and they strongly discourage overnight guests for the purposes of unmarried sexual relations. Guess that was the guy who showed me the place in between spending the day at church. Gotta love the south. 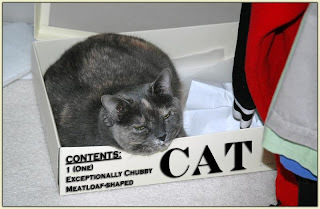 Elisson is so organized, he even labels his cats. 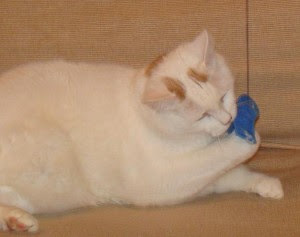 Tunch the wonder cat. I don't think he moves much more than that.